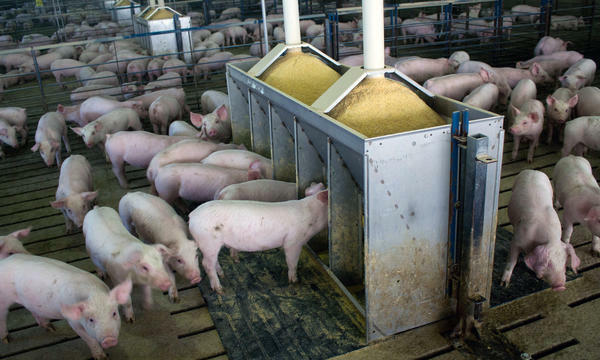 The World Health Organization says antibiotics should not be used to keep pigs and other livestock from getting sick, but U.S. agencies say the scientific evidence does not support such restrictions. The World Health Organization released recommendations this week to curb the use of antibiotics in livestock, saying it could help reduce the risk of drug-resistant infections in humans. But the U.S. Department of Agriculture says some of the guidelines from the United Nations’ public health agency would place “unnecessary and unrealistic constraints” on farmers and veterinarians. It's a disagreement that could have an impact on farm exports. The WHO says some antibiotics should be available to treat infections only in humans, not cattle, hogs and chickens, and that farmers should not use antibiotics to make healthy animals grow faster. Those ideas are in alignment with goals outlined by the U.S. to slow the spread of antibiotic resistance. The WHO goes on to suggest, however, that animals should only be treated when they are sick, not to stop them from getting sick. U.S. policy still allows veterinarians to prescribe antibiotics preventively. “The WHO guidelines are not in alignment with U.S. policy and are not supported by sound science,” Dr. Chavonda Jacobs-Young, the acting chief scientist at the USDA, said in a statement. Jacobs-Young says there's no indication that restricting preventive treatments would have a meaningful impact on drug-resistant bacteria. The Food and Drug Administration, which is in charge of regulating veterinary drugs, says preventive antibiotics need to be available to avoid widespread illness in animals, such as respiratory illnesses that commonly infect hogs and cattle in confined-feeding operations. “However, to ensure these drugs are used judiciously, FDA believes it is critical that these uses are under the oversight of licensed veterinarians,” the agency said in a statement to Harvest Public Media. WHO guidelines have no direct bearing on U.S. policy, but the agency can influence international guidelines for livestock treatment from its fellow U.N. agency, the World Animal Health Organization and the Codex Alimentarius, a set of consensus food safety standards. A Codex committee will gather later this month in South Korea to discuss guidelines around antibiotic-resistant bacteria in food. “(The standards) are not binding on anyone, but under the World Trade Organization they’re considered the minimum standard,” Michigan State University law professor Neal Fortin says. But the Codex keeps countries from setting up tariffs under the guise of food safety, he adds. The U.S. has referred to the Codex to pressure the European Union to allow imports of meat treated with growth promoting hormones. The E.U. claims some hormones are unsafe for humans to eat, but the Codex says they are safe. “The Codex can be used to help show that something is more restrictive than necessary for health and safety,” Fortin says. It is beneficial for international guidelines to match the practices of U.S. farmers when it comes to antibiotics, Fortin says, because when there are trade disputes it can help keep doors open to livestock exports. Copyright 2017 Harvest Public Media. To see more, visit Harvest Public Media.